The Lowndes Foundation is a 501(c)(3) exempt private foundation located in Boston, MA. The executive director, William Lowndes III, serves on the board for State Policy Network think tank, South Carolina Policy Council, and is the Chairman and CEO of Tindall Corporation, based in Spartansburg, South Carolina. Although the foundation did use to give grants to local and community organizations like schools, churches, food shelters, etc., now, the foundation almost exclusively gives funds to members of the right-wing State Policy Network. Of the $1,940,507 donated by the Lowndes Foundation from 2010 to 2012, $1,372,124 has gone to SPN Members. 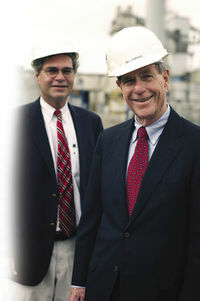 While both founders are from South Carolina, their 990 forms indicate the foundation's mailing address is in care of the Atlantic Trust Company, located in Boston, Massachusetts. The Atlantic Trust Company is a private wealth management firm with offices around the country, but with no offices located in South Carolina. The nearest office is located in Wilmington, North Carolina. The firm and the foundation also do not share any staff members. However, both William Lowndes III, executive director of the foundation, and John Maloney, Vice President of the Boston office of Atlantic Trust Company, are on the board of directors at the South Carolina Policy Council, which the Lowndes Foundation is a strong supporter of. Maloney serves as the Chairman, while Lowndes III serves as a director. Competitive Enterprise Institute received $15,000. Fund for American Studies received $5,000. George Mason University received $125,018. State Policy Network received $55,000. Intercollegiate Studies Institute received $20,000. Atlas Economic Research Foundation received $150,000. Institute for Justice received $45,000. Foundation for Economic Education received $135,000. Students for Liberty received $35,000. American Enterprise Institute received $30,000. South Carolina Policy Council received $440,106. Americans for Limited Government received $10,000. Advocates for Self-Government received $10,000. "We, the undersigned members of the Patriots Club of the South Carolina Policy Council, openly declare our commitment to making South Carolina the freest state in America. We publicly take responsibility for monitoring government, and for informing and engaging others in our communities to become equally vigilant. We will not compromise our right to govern ourselves, to prosper through our own efforts and to be free from the heavy hand of the federal government." The Lowndes Foundation does give to organizations outside State Policy Network, but many of these organizations hold the same right-wing ideology and values as the SPN Members. These organizations include the Independent Institute, the Clemson Institute for the Study of Capitalism, and the Ludwig von Mises Institute, which seek to promote free-market ideology, limited power for the federal government, and privatization. The foundation has also given to U.S. English, an organization opposed to bilingual education and in favor of legalizing English as the language of the U.S.A. The foundation has given to universities, such as George Mason University, Clemson University, and Hillsdale College, but each university has a center, such as the Institute for Humane Studies or the Clemson Institute, or leader, like President Larry Arnn from Hillsdale, that focuses on right-wing causes and efforts. ↑ 3.0 3.1 3.2 3.3 2012 Form 990, organizational IRS tax filing, May 22, 2013. Lowndes Foundation, 2012 Form 990, organizational IRS tax filing, May 22, 2013. Lowndes Foundation, 2011 Form 990, organizational IRS tax filing, May 18, 2012. Lowndes Foundation, 2010 Form 990, organizational IRS tax filing, April 25, 2011. This page was last edited on 2 August 2013, at 21:57.